American pop-rock outfit OneRepublic will be returning to Malaysia as part of the Asian leg of their world tour in support of their fourth and latest top-charting album, “Oh My My”! 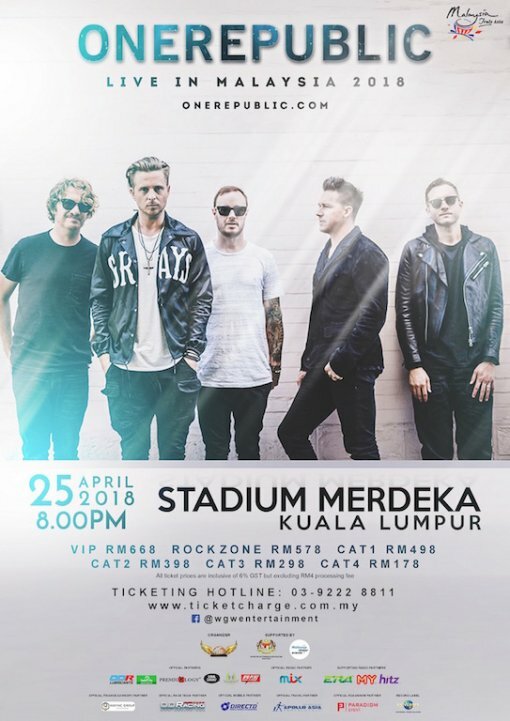 Organised by WGW Entertainment and supported by Malaysia Major Events (MME), a division of Malaysia Convention and Exhibition Bureau (MyCEB), a bureau under the Ministry of Tourism and Culture, OneRepublic Live in Malaysia 2018 is set to illuminate Stadium Merdeka at 8 pm on 25 April. Tickets are available through TicketCharge platforms.